Whale watching at Calafia Condos. Right from our Sales Office at Calafia Condos. Book a tour and see the whales! 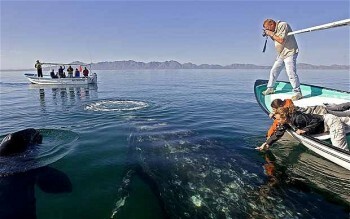 Baja California, on the wild Pacific coast of Mexico, is the best place in the world to see whales in all their glory. That’s why the zoologist Mark Carwardine heads there at this time every year to get his fix. I am a whale addict. I need to see a whale at regular intervals just to survive normal daily life. Since I saw my first exactly 30 years ago, I’ve been whale-watching in at least 50 different countries – many more times than I can remember – and yet every time I head out to sea I get the same buzz of anticipation I felt the first time around. But there is one whale-watching hot spot that has had a greater impact on me than anywhere else on the planet. I’ve returned there once, twice or three times a year since the late Eighties – doing research, taking photographs and leading tours – and miss it enormously when I’m somewhere else.